With the help of this funnel, I was able to accelerate the revenue growth even when my client had an average website, limited funds, and ordinary/regular products! How did I exponentially grow the revenue in record time? I used the ‘Golden E-Commerce Funnel’. In this case study, I will show you exactly how I did it, step-by-step. How Golden E-Commerce Funnel Generates Massive Revenue Growth? Before I tried this strategy my results were not consistent. I was not sure if I was maximizing revenues by targeting many prospects in various stages of their buying journey. Conversion rates and ROAS (return on ad spend) was low and scaling the revenue was difficult. 7.9X return on ad spend (ROAS) at scale. That means for every dollar spent my client made $7.9! The Golden E-Commerce Funnel is an evergreen Facebook funnel that continuously improves itself after every purchase. Every purchase made on your e-commerce store automatically refines the target audience in the funnel and your ad is shown to people most likely to buy. How? You will know it by the end of this post. TOF: Top of the funnel campaign will target 3 types of cold audience and get new prospects into your funnel. MOF: Middle of funnel campaign will target the warm audience, i.e. people who have interacted with your website/videos in some form but have neither added an item to cart nor purchased. BOF: Bottom of Funnel (BOF) campaigns will target hot audience i.e., people who have added items to cart but not purchased. Each campaign consists of a specific set of audiences. Step 1: Create top of funnel (TOF) campaign and target cold audience i.e. prospects who have never visited your e-commerce store. This campaign will be an evergreen source of new customers for your funnel. In this campaign, you will create a custom audience that is demographically and psychographically very similar to your past buyer. You do this by creating 1% lookalike audience of past customers. Step 1: Go to your Facebook Ad Manager > Audience > Create Audience > Custom Audience > Select Website Traffic >You will get to the screen below. If you have set up your Facebook pixel correctly, every time a person buys from your store ‘purchase’ pixel is fired. On the screen below you are creating an audience of people who have purchased (‘purchase’ pixel fired) in the last 180 days. I have named this audience ‘Purchased in last 180 days’. Next click on create audience. Now we will tell Facebook to create an expanded audience (1% lookalike) of people who are demographically and psychographically very similar to your past buyers. This is how you create 1% lookalike audience of your past buyers. 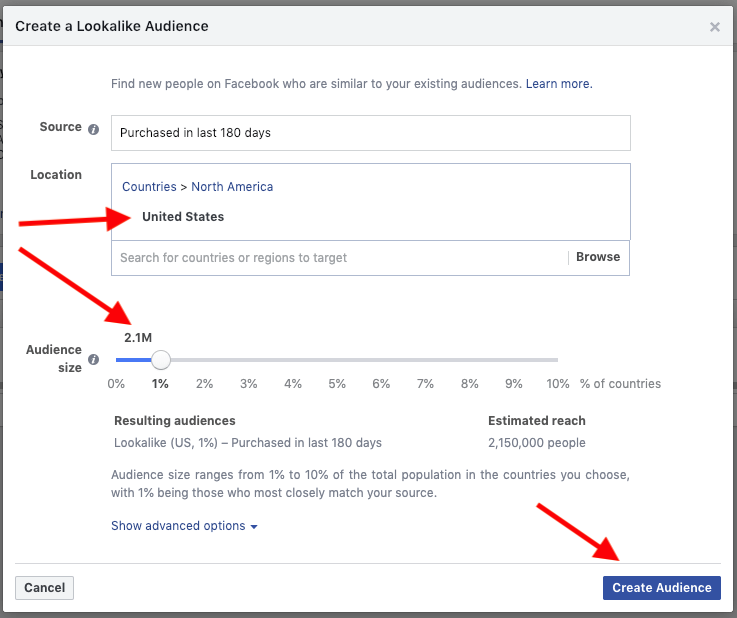 In the 1% lookalike audience Facebook ad platform will select people that are very similar to your customers. Therefore this audience is more likely to buy your product. 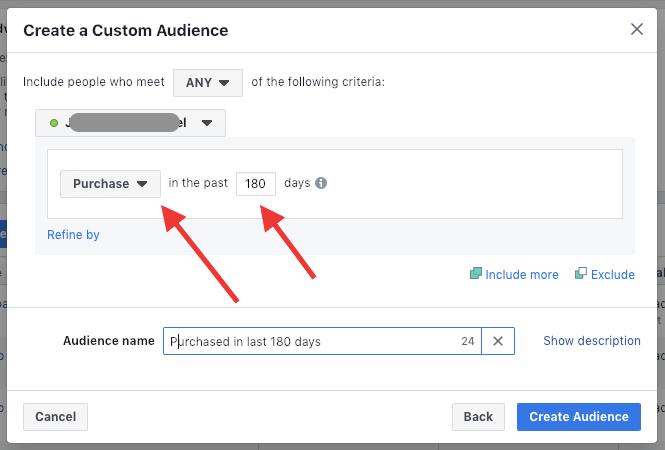 Every time a purchase is completed, Facebook updates your past buyer audience (as you have a new buyer) and this updates and refines the 1% lookalike audience to create a tighter audience most likely to buy your product. Step 2: Create Middle Of Funnel (MOF) and re-target warm audience of people who have visited your website but have not added any items to cart. Has this happened to you? You viewed a particular product on Amazon or on some website and then you see that product on other websites? This is ad re-targeting and you are being re-targeted by the seller to consider that product again to buy it! Using catalogue ads of Facebook, you can show the same products to people who visited detail page of that product but didn’t add to cart or buy. The buying cycle for most e-commerce stores that sell low to medium priced products is short. People take less time to decide on products less than ~$50, they usually buy within first few days of viewing the product. Therefore, maximum sales take place within 1-2 days of visiting the website. But if you sell expensive products your buyers might need more time to decide and the maximum sale might occur on the 7th to 10th days after viewing the product. You can check the buying pattern of your customers using Google analytics. Log into your Google Analytics go to Conversions> Multi-Channel Funnels> Time Lag Report. This is the Time Lag Report of my client. The screenshot above shows that ~56% of people visited the product detail page and bought the product on the same day or the next day. 2.9% bought 2 days after visiting the product detail page. 2.4% bought 2 days after seeing the product. And it reduces further each day. The total purchase of people who visited the product detail page 12 to 30 days ago is ~26%. So how does this information help you? It means we should focus most of our re-targeting budget for 0-1 day, next 1-3 days and so on. A good percentage of people ~26% bought 12 to 30 days after visiting the website. But it is expensive to acquire such customers since we must keep showing them ads for 12-30 days to bring them back to the website. Therefore, begin with allocating less budget to this audience. You can re-adjust the budget based on performance once your ads are running for a few days and you get data. Based on the time lag report above we will create a retargeting stack for website visitors who visited the website 0-1 day ago, 1-3 days ago, 3-7 days ago, 7-14 days ago and 14-30 days ago. Next, since maximum conversion occurs with 0-1 day, we will allocate 60% of the budget for 0-1 day adset and 10% each for 1-3 days, 3-7 days and 7-30 days adset. This is how you can efficiently use the ad budget and get maximum ROAS. Step 3: Create Bottom of Funnel (BOF) and re-target your hot audience who have added items to cart but not purchased yet. People who have added products to their cart but have not purchased are your best prospects because they are the closest to buying that product. Once they add the product to the cart and leave the website without purchasing it you can re-target them and show them the same product again so they can buy it the next day. You will create the catalog ad campaign (similar to campaign in step 2) and retarget people who have added the product to cart but not purchased. Keeping the same structure in step 2, we will create the following adsets of people who have added to cart but not purchased in the last day, 1-3 days, 3-7 days, 7-14 days, 14-30 days. Based on the time lag report in step 2, again we will give more budget to people who have added to cart in 0-1 day. This is how you can use the Golden E-commerce Funnel and maximize your revenue and profits quickly and easily. If you have any doubts or need any help contact me. Happy to help! I have seen that most marketing firms simply copy/past Adwords campaign structure to Facebook and it never works well. You can target people in different stages of the buying cycle with different messaging to maximum conversions. You can give more budget to a specific audience within the warm and hot audience, so you get a maximum return on investment. This funnel gives you the flexibility to include more audience in different stages and test out what works best. Hope you can see the potential of Golden E-commerce Funnel for your E-commerce business. Unlike spending loads of money to test out funnels hoping that something might work you now have a proven and tested funnel. With this funnel, you are way ahead of most of your competitors. Yes, it takes some hard work to create something great. If you receive value from my post, I would appreciate a Facebook share! Like to scale your business profitably? So, here's the deal...If I can help you, I will. And If I can't, I'll still help you. I'll give you my honest feedback and tell you what I would do if I were in your shoes.